View More In Candy Making Supplies - Page 5. Designed with your health and taste buds in mind, food preparation is just as important as the food itself. The tools and methods you use to prepare your meals can change how your body feels. Silicone has a high melting point, meaning it won't melt while cooking. Additionally, it cools down quickly and will not crack or shatter due to sudden temperature changes. (Please note that the 5 colorful plastic measuring spoons can't be heated). Silicone kitchen products are non-stick, meaning less oil and butter in your diet. This also eliminates the need for wax paper or foil that will inevitably end up in the trash. Because it is easy to clean and dries quickly, you also use less water. Silicone Molds can be folded without losing their shapes - great for repeated use and easy storage. With the Silicone Baking Molds 4-in-1 Set, you can bake your favorite sweets quickly and easily. This set includes both circular and rectangular,,star and Heart-shaped mold trays , so you can make all shapes of sweets and treats. The trays are dishwasher-safe, meaning less time cleaning and more time eating with your family and friends. It's best gift for kids, suitable for family diy activities with children. 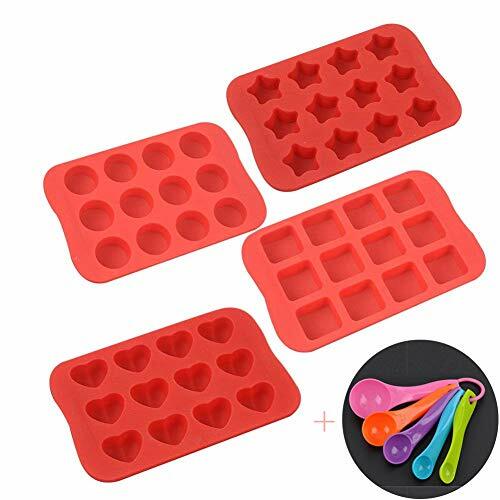 Package Includes: 4-in-1 Set of baking molds includes circular,rectangular,star and Heart-shaped mold trays non stick silicone baking mold tray,and with 1 set of 5 piece plastic measuring Spoons, for mini cupcakes, mini muffins and mini brownies. Customer First: Reliable customer service is our priority. Product comes with the Guarantee. If you are not fully satisfied with your product, we readily offer a hassle-free 30-Day Money Back Guarantee. If you have any questions about this product by Raoes, contact us by completing and submitting the form below. If you are looking for a specif part number, please include it with your message.